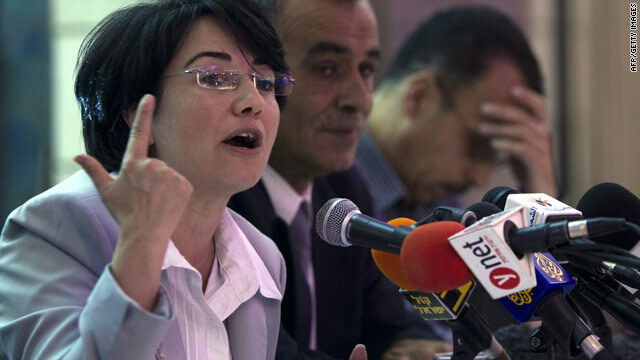 Israeli Knesset Member Hanin Zoabi holds a press conference after the Israeli raid on the flotilla. (CNN) -- Some of the first accounts emerged Tuesday from eyewitnesses who were aboard several boats stormed by Israeli forces as they approached Gaza the day before. Hanin Zoabi, a member of the Israeli parliament, was on board the Miva Marmara, the ship that was the scene of a confrontation between activists and Israeli soldiers. That clash left at least nine people dead. The Israeli Navy fired on the ships five minutes before commandos descended from ropes that dangled from helicopters, Zoabi said during a press conference in Nazareth, Israel. She said passengers on board the ship were unarmed. Israel has said its forces found several weapons among the passengers on the Miva Marmara. Israel also has said that its forces started shooting after passengers on the Miva Marmara assaulted them. She urged Israeli authorities to investigate and to let the news media interview passengers who have been detained. Zoabi said she believes Israel has video footage of how the ten passengers were killed, and she called on Israeli authorities to release that footage. Israeli Foreign Minister Avigdor Lieberman has said that of the six ships in the flotilla, the people prepared an ambush on one, a reference to the Turkish ship. But on the other five, "the people got off without a scratch." Huwaida Arraf, one of the Free Gaza Movement organizers, told CNN Israeli troops roughed her up when they responded aggressively to her ship, a smaller one in the flotilla that was near the Turkish vessel where the casualties occurred. "They started coming after our ship," she told CNN, "so we took off and they charged us also. Eventually, they overtook our ship and they used concussion grenades, sound bombs and pellets." She said the people on her ship tried to keep them off. She said they were told the vessel was American and the people aboard were unarmed. Her account could not be independently verified.